After a long run with Google Reader, I’m switching over to NewsBlur. Two key points to the decision: it’s open source and Samuel is experimenting with ways to enhance your information management. For the former, one idea that’s already come up: I’d love to contribute “Share to WordPress” integration. Oh, and it would be really neat to pull comments already on the post into the reading experience. There seem to be some type of comments limited to just NewsBlur. The user experience has significant room for improvement. Hopefully he takes the dough he’s pulling in now to hire a proper designer. 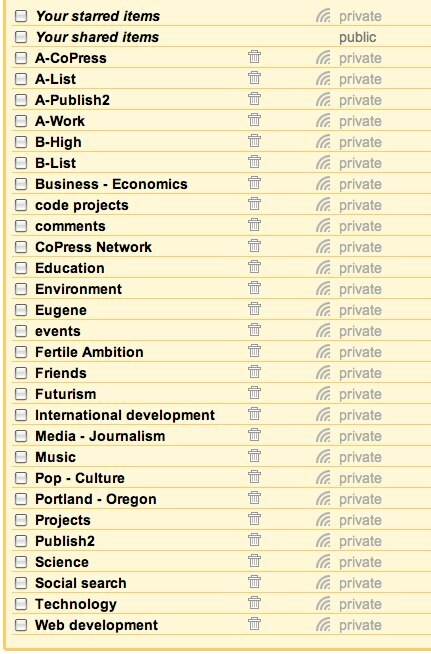 It’s also been on my list for a long time to cull my feed subscriptions. Based on what I’m seeing, roughly 90% of blogs died between 2010 and early 2012. It’s time the Open Web became the cool thing to hack on again. RSS is frequently said to be a dead technology, which is silly on a lot of levels, but I don’t begrudge the many people who say that, for them, Twitter has replaced RSS. It’s just that I place a premium on reading stuff that others aren’t and don’t find that my Twitter stream reliably reaches into the bowels of the Web. Google Reader redesign: terrible decision or worst decision? Google’s current “bet everything on social now because we missed the boat” movement feels a lot like Microsoft’s “bet everything on the internet because we missed the boat” movement in 1997. Marco Arment — Google Reader redesign: terrible decision or worst decision? Google Reader’s new web interface is unusable for me. Good thing I have Reeder (for now). Posted byDaniel Bachhuber November 14, 2011 Posted inquotesTags: design, Google Reader, Marco Arment, RSS2 Comments on Google Reader redesign: terrible decision or worst decision? Jetpack. New service from Automattic for a more seamless experience between WordPress.org and WordPress.com. My bet: This is how WordPress will begin to compete again with Facebook, Tumblr, Twitter, etc., also known as services with built-in subscription interfaces. Watch it happen. Plug one: There’s a report making its way around the internet that says the youth are spending less time blogging. Specifically, “28% of the two groups studied — teens 12 to 17 and young adults 18 to 29 — actively blogged.” For 2009, this percentage has dropped off to only 14% of teens and 15% of young adults. The author attributes this drop to a rise in the use of Facebook. Plug two: Marshall Kirkpatrick floated a related idea the other day that Facebook is now the world’s leading news reader. There are at least a few reasons: Facebook has the largest, most active user base on the planet, Facebook gives you control over who has access to your content which leads to a greater willingness to share, and Facebook wraps the whole creation/consumption experience into a nice, easy to use interface. That last point is the most critical, in my opinion. As average Joe, it’s much, much easier to publish with Facebook (or Twitter) because there is tremendous attention paid to the experience of how content is consumed on a regular basis. Both Facebook and Twitter have dedicated dashboards for your subscriptions where you get visual reinforcement that other people are coming across your content. With my blog, I have a home page which my dad or mom might read occasionally, and X number of faceless RSS subscribers who may or may not “Mark All As Read” on a daily basis. Figuring out how to use Google Reader to read other blogs almost requires the scientific method, which could be a good thing if you consider yourself a geek but is almost certainly a bad thing if you’re a Normal just wanting to read the national news and your friends’ writing. Moral of the story: Always take studies with a grain of salt. I suspect The Youth are publishing more than ever, but it’s coming in the form of Facebooking and Tumblring instead of maintaining a blog because the proprietary tools, unfortunately, have better readers right now than the open source ones. For reasons unbeknownst to me, Feedburner, once the Holy Father of RSS services, has decided to update its services such that it will break my RSS feed within the month. As my subscribers are low enough in numbers, won’t you resubscribe? Thanks!